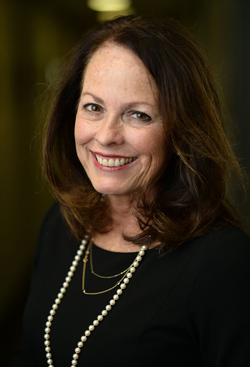 Kathryn Newcomer is the Director of the Trachtenberg School of Public Policy and Public Administration at the George Washington University where she teaches public and nonprofit program evaluation and research design. She routinely conducts research and training for federal and local government agencies and nonprofit organizations on performance measurement and program evaluation, and has designed and conducted evaluations for many U.S. federal agencies and dozens of nonprofit organizations. Her research has focused on accountability in government, with a special focus on the Federal Inspectors General. Dr. Newcomer has published five books, Improving Government Performance (1989), The Handbook of Practical Program Evaluation (1994, 2nd edition 2004, 3rd edition 2010 and 4th edition 2015), Meeting the Challenges of Performance-Oriented Government (2002), Getting Results: A Guide for Federal Leaders and Managers(2005), Transformational Leadership: Leading Change in Public and Nonprofit Agencies (2008), a volume of New Directions for Public Program Evaluation, Using Performance Measurement to Improve Public and Nonprofit Programs (1997), and numerous articles in journals including the Public Administration Review and the American Journal of Evaluation. Dr. Newcomer is a Fellow of the National Academy of Public Administration, and currently serves on the Comptroller General’s Educators’ Advisory Panel. She served as President of the Network of Schools of Public Affairs, Policy and Administration (NASPAA) for 2006-2007 and as a member of the board for the American Evaluation Association from 2012-2015. In 2015, she was elected President-Elect of the American Evaluation Association (AEA) and served as AEA President in 2017. She has been appointed to serve on six Committees of the National Academy of Sciences since 2008. She has received several awards, including the Elmer Staats Award for Achievements in Government Accountability, awarded by the National Capital Area Chapter of the American Society for Public Administration in 2008, the Oscar and Shoshanna Trachtenberg Prize for Service in 2014 and the Duncombe Excellence in Doctoral Education Award awarded by NASPAA in 2016. She has received two Fulbright awards, one for Taiwan (1993) and one for Egypt (2001-04). She has lectured on performance measurement and/or public program evaluation in Ukraine, Brazil, Italy, China, Costa Rica, Honduras, Australia, Canada, Egypt, Taiwan, the United Arab Emirates, Israel, Poland, Colombia, Nicaragua, and the UK. Dr. Newcomer earned her BS and MA from the University of Kansas, and her PhD in Political Science from the University of Iowa. “Presidential Evidence Initiatives: Lessons from the Bush and Obama Administrations’ Efforts to Improve Government Performance.” Bipartisan Policy Center Technical Paper, February, 2018. Co-author: Nick Hart. “Developing and Sustaining Effective Faculty Mentoring Programs” with Joselynn Hawkins Fountain. 2016 Journal of Public Affairs Education. “How the Trump Administration Could Get a Better Return on a $650 Billion Federal Investment,” with Jeff Myers and Katherine Dawes, Government Executive 2016. “Mixed-Methods Inquiry in Public Administration: The Interaction of Theory, Methodology, and Praxis” with Estelle Raimondo, Review of Public Personnel Administration. 2017. Newcomer, Kathryn, Harry Hatry and Joseph Wholey (editors) 2015. Handbook of Practical Program Evaluation, 4th edition. Jossey Bass Publishers. “Public Performance Management Systems: Embedding Practices for Improved Success.” 2011 Public Performance and Management Review, Volume 35, Number 1. Co-author: Sharon Caudle. "Expectations and Capacity of Performance Measurement in NGOs in the Development Context.” 2013. Public Administration and Development, Volume 33, Issue 1, February, pp. 62-79. Co-authors: Laila El Baradei and Sandra Garcia. “Forging a Strategic and Comprehensive Approach to Evaluation Within Public and Nonprofit Organizations: Integrating Measurement and Analytics Within Evaluation.” 2015 American Journal of Evaluation. Co-author: Clint Brass. Balancing Independence and Positive Engagement: How Inspectors General Work with Agencies and Congress. April, 2015. A Report from IBM Center for the Business of Government. Co-author: Charles Johnson. "Outputs to Outcomes." 2015. Chapter in Public Administration Evolving: From Foundations to the Future edited by Mary Guy and Marilyn Ruben. Wash., D.C.: American Society for Public Administration. “Ethics and Program Evaluation.” 2015. Chapter in Encyclopedia of Public Administration and Public Policy, Third Edition. Oxford University Press. Co-authors: Steven Mumford and Burt Barnow. “Carol Weiss, Evaluation Research: Methods for Studying Programs and Policies.” 2015 Chapter in The Oxford Handbook of Classics in Public Policy and Administration. Edited by Steven Balla, Martin Lodge and Edward Page. Oxford University Press. “Evaluating the Performance of Public Programs.” 2015. Chapter in James Perry and Robert Christensen, editors. Handbook of Public Administration, 3rd edition. Wiley Publishers. Elected Fellow of the National Academy of Public Administration, 1996. Served as President of the National Association of Schools of Public Affairs and Administration(NASPAA) for 2006-2007. Elected to the Board of the American Evaluation Association for 2012-2014. Distinguished Public Service Award from the National Capital Area Chapter of the American Society for Public Administration, 1990. Fulbright Fellowship, Taipei, Taiwan, Republic of China, Spring, 1993. Award from The National Science Council, Republic of China, Spring, 1993. Fulbright Award for Bilateral Curriculum Development with Cairo University, 2001-2004. Appointed to the Advisory Committee on Business and Operations of the National Science Foundation, 2008-2014. "I teach smart people in my classes at GW and have opportunities to interact with government leaders to teach them how to apply effective program evaluation techniques to their jobs."